I’m about to blow your minds. Or make you really hungry, at least. As you know, I’m all about modifying meat-y classics so that I can enjoy pescetarian or veg spin-offs while still cooking for my omnivore husband. It’s how I manage to make two somewhat different dinners without losing my… marbles. He loves chicken piccata, so I make a shrimp-y version for myself. When he’s hankering beef and broccoli stir-fry, I’ll replace the beef with tofu for myself. Easy peasy, lemon squeezy! With experience, it just gets easier and more enjoyable. (As enjoyable as cooking two different dinners can get, anyway.) And in case you’re wondering why I do make dinner for my husband most nights, it’s not because we are a gender role household by any means. It’s just that if I don’t, he’ll eat cereal or chips and I kind of want to nourish the man, you know? When it came to beef stroganoff, I decided that making a full-blown mushroom stroganoff was not only a simple solution, but a freakin’ delicious one. I quartered some big and gorgeous cremini mushrooms and, low and behold, that was all the heartiness this dish needed. I also substituted sour cream with plain Greek yogurt. Don’t look at me that way – it totally worked. I wouldn’t suggest it if it wasn’t off-the-charts delicious, mmmkay? To a large saucepan, add the mushrooms, onions and garlic; simmer, stirring occasionally, until the onions and mushrooms are tender (approx. 5-7 minutes). Transfer the mushrooms and onions to a bowl and set aside. To the same saucepan, add 1 cup of the broth, the salt, and the Worcestershire sauce. Bring to a simmer, scraping the brown bits from the pan for extra flavor. In a small bowl, mix the remaining 1/2 cup of broth with 2 tablespoons of corn starch. Slowly add the broth and starch mixture into the pan while whisking. Whisk until mixture thickens. Add the mushrooms and the onions to the pan and allow to simmer for 1 minute, stirring constantly. Finally, bring the heat to low and stir in the Greek yogurt until you end up with a nice and thickened sauce. Heat the mixture, but do not bring to a boil. Be sure to use full-fat Greek yogurt to avoid curdling over heat. Happy to help. Curds are fine for cottage cheese but not for Stroganoff! Looks great, thanks! But (and you probably already knew this) be SURE to use full-fat yogurt (not low-fat or non-fat) to help curb yogurt's natural inclination to curdle with heat ... learned from experience. Like you I have a carnivorous husband, so I'm all about making vegetarian versions of meat classics, and mushrooms are my favourite ingredient for this as they have so much umami. Thankfully most of the time my husband is happy to eat vegetarian 99% of the time. I can't imagine cooking separate dishes all the time. You have my sincere respect! Strogonoff is such a comfort food!! I can't believe that you cook different food for you and your husband!! WOW!! Hey, Ludmilla! I agree, it is so comforting! Haha yeah - I mean, I try to stay within the same concept of the meal I just swap out the meat part of fish or vegetables where I can for myself. I didn't want my diet to affect him since it ~was my choice. It's forced me to get creative and think outside the box, that's for sure! Good ideas about how to modify your dishes to keep everyone in the household happy - not always easy! Hey Elissa - thanks! It can be a challenge, but it's a great way to try new things and be innovative. Silver linings! Haha. I'm so impressed that you cook separate meals for the hubs! Mine eats what I eat.. I'm not cooking twice. Lol. He gets his beef fix when we go out to eat. This sounds amazing- I'm mushroom obsessed! Hey, Sarah! Haha - I suppose it's the whole "still in the first year of marriage" thing could be playing a factor in the fact that I'm currently okay with putting extra effort into dinner ;) But it definitely forces me to get creative so it's good experience under my belt (looking at the positives, ha!) This is perfect for anyone mushroom obsessed! Let me know if you try it. I hope you love it! Oh, my heavens. I'm ready to dive right in. 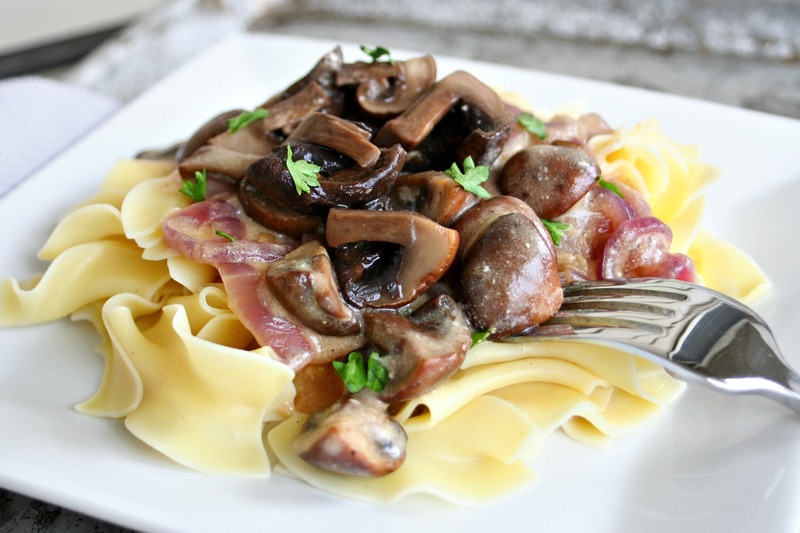 The whole dish looks appetizing but the mushrooms are out of this world! Thanks, Jackie! Cremini mushrooms really are stunning. I can't remember the last time I bought white button mushrooms. Something about the brown and beige tones in those cremini just make the presentation!